Theo, the warmhearted heroine from The Imaginary Garden (2009), creates an unforgettable adventure for her beloved Poppa’s birthday. Theo’s Poppa keeps his travel mementos in an old trunk. Through these items, Larsen tells the story of the man—where he’s been, whom he loves, what he values—which must be why Theo pores over each picture, map, and trinket. They speak of excitement and adventure, and they make Theo want to be an explorer too. As Poppa’s birthday nears, she ponders over the perfect present. When Poppa recalls a special meal by the ocean with Nana, Theo realizes what to get him: a trip together! With a hand-drawn map for a guide, they ride the streetcar toward the sand. There, they skip stones, walk barefoot, and find the best gazpacho. At home, Theo adds tokens from the day to Poppa’s memory trunk, knowing their outing made his birthday wish come true. 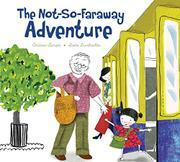 Theo and Poppa are white, and they traverse a vibrant, multicultural city on their adventure. Luxbacher’s choice to use digital collage ties into the narrative, as found cloth, paper, and photographs become part of a larger story. But it’s Larsen’s compassionate text that makes this intergenerational story soar, simple, declarative sentences evoking the sincerity of Theo’s excitement.